COLUMBIA, MO — University of Missouri officials today announced changes to the university’s fraternity and sorority life system that will help position the community as a national model. The changes include practices designed to support greater student success, safety and sustainability of Mizzou’s fraternities and sororities. Attaining a minimum 3.0 GPA average for two consecutive semesters by 2021. Confirming that any freshmen who are moving in to the facility are in good standing with the university during their first semester. The chapter also must remain in good standing with the university in order to house any uninitiated freshmen. The changes, which have been shared with Greek student leaders and many alumni, are the result of nearly two years of study and discussions. In 2017, a Greek life consultant conducted a comprehensive review and risk management assessment of fraternity and sorority life at Mizzou. An advisory board of more than 40 alumni, parents and students (most of whom are members of fraternity and sorority organizations) reviewed that information and developed recommendations released in July. Since then, the recommendations have gone through several revisions as members of the community were invited to provide feedback through a series of small group meetings, larger public events or online. 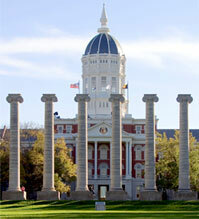 Mizzou’s sorority and fraternity community is among the largest in the nation with roots going back 150 years. Greek organizations provide valuable leadership opportunities and social supports while building on a foundation of service and philanthropy. Dean of Students Jeff Zeilenga has helped coordinate the Greek life review from the beginning of the process. Zeilenga said the university is committed to providing academic advising support to chapters. Zeilenga noted that care was taken to develop a reasonable timeline and implementation requirements for houses. The minimum GPA required for freshmen to live in houses, for example, does not go into effect until 2021. For any chapters struggling to reach the threshold, the university will connect chapters with current academic resources and fund academic advisors for those chapters, as well as fund or co-fund a stipend for a faculty mentor.